How is it that animals can wrap themselves so tightly around our hearts? Especially the one I always said I would NEVER own. I did not want a male dog. Ever. Female dogs only for me. Then I met Jack. Oh Jack. Some good friends of ours were taking care of him until a permanent home could be found. 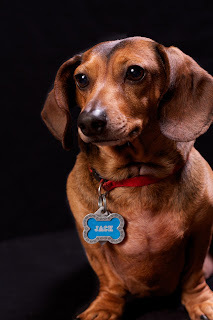 Even though he was a dachshund (I do love doxies!) I figured it would be safe for me to see him and not want him, since he was a male dog and I was never going to own one. So much for that theory. He was just the most adorable thing, and had an amazing personality that made him irresistible. So, we decided to take him home for the weekend and see if he would get along with our other doxie Rune. She wasn't real crazy about him at first, she let him know right away who the dominant dog was! He was fine with that, he was just happy as long as there were humans to scratch him and blankets to burrow under! Well that weekend quickly turned into us becoming his forever home. What we didn't know at the time was how short his forever was going to be. He was maybe 4 or 5 we didn't know for sure and we thought it would be great to have him as Rune is now 9 and we don't know how long she will be around. He brought much joy to this house, to the humans as well as to Rune - they would play like crazy together! He loved the boys and would choose to spend time with each of them, which only endeared him to me that much more! My mom said it best the other day when she said that he made everyone feel like the one he loved most. It's true, he really did make us all feel that way. Last weekend we noticed he was being more gentle with his back, walking down the stairs (3 to go outside) carefully and not jumping up on the couch. However Sunday he seemed to be doing better, so we figured we just needed to be very cautious with him and not let him jump or do stairs. Then, at 10:30 Sunday night after being outside he was walking towards me and just stopped. I called him and he came another 2 steps barely and stopped again. He never regained the use of his back end after that. We did what we could to keep him comfortable Sunday night and then got him to the vet Monday morning. We had the boys say goodbye to him just in case. The vet said it was very serious but there was a treatment they could try, so we decided to leave him there and let them do that. They also made sure to control his pain. I tried to get updates through the week and all I really got was that he did seem a little more himself. When I spoke with the vet on Thursday morning he told me that Jack had not responded at all to the treatment after 3 days. In this type of situation with this treatment there is change within those 2-3 days, if there isn't it means the damage is permanent. Well, we knew we didn't want him to be in pain or to have a hard life but making the decision was not easy. Especially when you have to add in the fact that we have two boys (6 & 12) who love that little dog. Unfortunately the decision that was best for Jack was the one that was hardest for us (still crying as I type this). Thankfully my parents live a block away and were able to come over and be here as I had to tell the boys (hubby was still at work, this wasn't easy for him either). We decided to put him down that day. We all went in and got to hold him again and say goodbye through the tears. We then took him out to our farm land and buried him. I am quite sure he will never be forgotten by us. He was only in our lives for 8 months but he left such an impression. We loved him dearly. Rune is also missing him, she still looks for him and is mostly only drinking from his water dish. He truly was an amazing dog, and as much as this hurts to lose him I am so incredibly thankful that we were blessed to have him as a part of our family! "I think God will have prepared everything for our perfect happiness. If it takes my dog being there in Heaven, I believe he'll be there." Then as the boys and I were driving to the farm from the vet this song was playing and it was so perfect. It was an opportunity to share with my boys that even though it hurts and even when it's hard God is still here with us. It can sure feel like He has forgotten about us when we are hurting but in fact His heart breaks too. It kept spritzing small amounts of rain that day and I kept telling the boys that God was crying too. I have written all this out as a way to deal with the grief I am feeling. We know we did the best thing and we looked at all the options before coming to this decision (would I really put my family through all this if I thought there was another option??). I would appreciate if you have comments about other options there could have been, if you would not share them. Thanks for listening (reading) as I work through this pain that has been left in precious little Jack's absence. Jack-Jack Chunk-a-Dunk Stink-a-Dink you will be greatly missed! Thanks for brightening our lives little dog!